Moncler is an Italian brand known for their luxe puffer coats. Just as Ugg dominates the sheepskin boot conversation, Moncler does the same for down puffer jackets. For the brand’s latest collection, they called upon eight designers to put a new spin on the puffer classic and create eight mini-collections under a larger umbrella called Moncler Genius. Millie Bobby Brown attended the Moncler Genius presentation during Milan Fashion Week 2018 and was among the first to wear a piece from the collection. Brown’s ankle-skimming, black puffer ~gown~ is from designer Simone Rocha’s collection, and who better to pull off this unique look than a precocious young actress like Brown. Brown kept her hair off her face, her nails black, and her jewelry at a minimum so that the coat/dress did all the talking. Basically, she was probably the comfiest person in all of Milan that night. A ~normal~ Moncler puffer will set you back a cool $1,500, so we can’t even imagine the cost of Brown’s down comforter gown. This look falls under the category of “couture,” but we’d like to take a nap in it, tbh. If you like what you see, you can scope the entire Moncler Genius collection here. 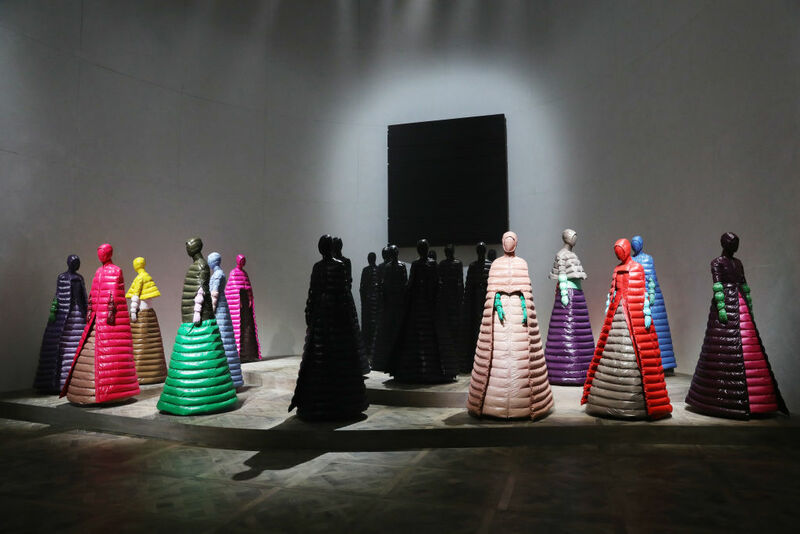 Below are the eight different interpretations of the quilted down jacket in the Moncler Genius presentation. Our favorite mini-collection would have to be the one designed by Valentino’s Pierpaolo Piccioli. His vision featured head-to-toe gowns with hooded overcoats — it’s both high fashion and scary à la The Handmaid’s Tale. The future of fashion looks cozy.